The Government of the Federated States of Micronesia’s (FSM) National Oceanic Resource Management Authority (NORMA) has received financing from the World Bank toward the cost of the Pacific Regional Oceanscape Program, and intends to apply part of the proceeds towards the procurement of one standby generator. Provide a standby generator in consideration of NORMA electricity requirements currently estimated to be around 13,500 watts or 13.5 kilowatts which is based on the existing load plus 10% for additional load. Install and connect standby generator within housing acceptably built by vendor (details to be provided in ITQ) including provision of all necessary connection accessories and housing materials and collaborating with local utilities company to ensure proper hook-up for automatic transmission switching. Provide basic user training on generator proper use and maintenance including the provision of a user-friendly maintenance plan for the expected life of the proposed generator. Bidding will be conducted through the Shopping procedures specified in the Guidelines for Procurement of Goods, Works, and Non-Consulting Services under IBRD Loans and IDA Credits & Grants by World Bank Borrowers, January 2011 and Revised July 2014 and is open to all bidders from Eligible Source Countries as defined in the Guidelines. Interested eligible vendors/suppliers can obtain further information from and must also request a formal Invitation To Quote (ITQ) preferably by July 15, 2018 (Pohnpei Local Time) from the following email address. Mr. OKean Ehmes, PROP Project Coordinator, okean.ehmes@norma.fm. 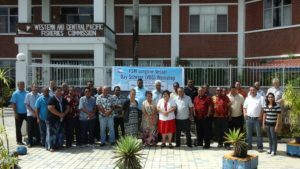 Forum Fisheries Agency and the Office of the Parties to the Nauru Agreement, and with funding assistance by the World Bank PROP. The objective of the workshop was to sensitize stakeholders about the Longline VDS and together explore the opportunities available in the FSM States for development of the longline fishery. Participants to the workshop included representatives from the FSM Department of Resources and Development andHeads or Senior Officials of State Departments’ of Fisheries, Economic Affairs, Investment, and Non-Government Organizations responsible for Natural Resource Management, and representatives from Lianchang Overseas Fishery, which is the only onshore investor in the longline fishery for FSM. Facilitator for the workshop was Mr. Wez Norris, former Deputy Director General of FFA and now Consultant to the PNAO. The LL VDS workshop commenced with welcoming remarks by the Executive Director of NORMA, Mr. Eugene Pangelinan, who welcomed and thanked participants for their attendance, and highlighted the importance of the workshop and FSM’s objective to develop the longline fishery in the FSM. Although the longline fishery is a minor contributer to FSM’s access fee revenues, there is great potential for onshore investment and generation of additional economic benefits in the form of employment and taxes and local provisions if well planned and implemented collectively nationwide. It was therefore important for participants to discuss how the States could facilitate these investments and maximize the returns to FSM from its longline fishery. He emphasized that the longline fishery suffered a decline in the mid 1990’s when one large foreign company departed the FSM leaving FSM with infrastructure that was hardly ever used again. Today, the opportunity to rebuild the industry is there with the support of Lian Cheng, who has remained in the fishery despite the many difficulties and challenges. FSM needs to work closely with the private sector to reinvigorate this industry which has remained dormant for decades. The Secretary of FSM R&D, Honorable Marion Henry followed with opening remarks, highlighting the importance of the fisheries sector to FSM and the importance of having a Fisheries Investment Policy which would provide a guideline of how fisheries investments could be facilitated. Representatives from Liancheng Overseas Fishery presented on the company’s current investments in the FSM and its future expansion plans, and spoke of theissues or challenges the company currently faced in the respective States they have invested in, including how the government could assist to ensure their investments are able to continue to grow. In addition to being sensitized about fisheries in the Pacific Islands, the PNA longline vessel day scheme and performance of the longline fishery in the FSM, participants were given the opportunity to discuss in working groups their State priorities and investment potentials, as well as the current challenges faced in each State and actions that need to be taken to address those challenges. Those discussions were an important result of the workshop as it would feed into the Fisheries Investment Policy that FFA is currently assisting the FSM Government with. It is anticipated that by the end of this year this Fisheries Investment Policy would be completed. To celebrate World Tuna Day on May 2, 2016, the Parties to the Nauru Agreement (PNA) hosted an Art and Talent Quest competition among entries from all the PNA Countries. The winner for the 2016 competition was a poem entitled “Teach Your Children” by Ms. Jasmine Mendiola of Pohnpei, FSM. It was then that the National Oceanic Resource Management Authority (NORMA) came to know of her passion for the marine ecosystem and all her work and efforts in the conservation and management in this area, through aquaculture and education. Consequently, NORMA appointed her as the Fisheries Ambassador in an effort to link the public with NORMA’s continued work in pelagic fisheries management. 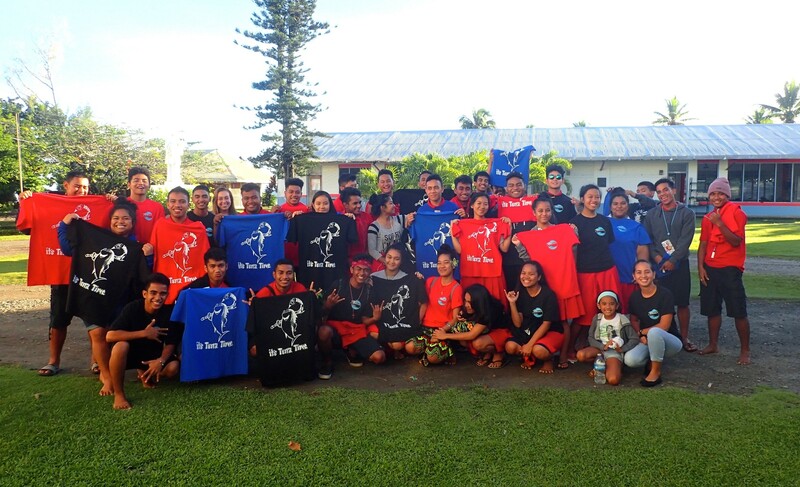 The Fisheries Awareness Ambassador has conducted awareness presentations in Chuuk institutions including Xavier High School, Berea Christian School, Saramen Chuuk High School, Chuuk High School and COM Chuuk Campus, reaching over 240 participants. She has also done the same at Yap institutions such as Yap Catholic School, Yap SDA School, COM Yap Campus and COM Fisheries and Maritime Institution (FMI) where the awareness program reached over 140 participants. While in Yap, Japanese volunteer to NORMA, Ms. Megumi Oda conducted educational art activities with the 2nd, 3rd, and 4th Graders of Yap SDA School. Ms. Oda asked the young students if they had seen tuna and if they liked tuna, the students exclaimed, “yes!” cheerfully. She explained to the young students the external features of the three main types of commercial tuna caught in the FSM, which are yellowfin, bigeye and skipjack. With art supplies provided by NORMA, the students were then asked to freely draw some tuna. She then explained the different fishing methods using bigillustration panels, which the students referenced to fill out their small workbooks. 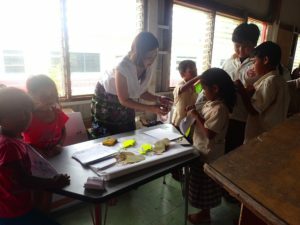 Once the activity was done Ms Oda distributed small gifts she prepared as a reward for completing the learning activity. “The children drew wonderful tuna pictures! I hope they learned something about tunas while having fun.” Ms. Oda. 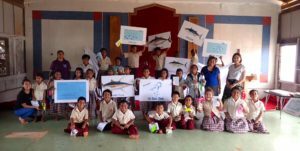 This is the first time NORMA has extended its fisheries awareness program to students in primary schools. Mendiola will be traveling to Kosrae at the end of April to continue NORMA’s awareness program and to assist in the coordination of World Tuna Day celebrations in Kosrae on May 2nd.